downtown in the early 20th Century. frequent blazes. When the owners rebuilt, they went with brick and stone. and citizens, and has played a big part in its history. from public wells and did their best to extinguish the fire." the empty bucket back via the second line to be refilled. "To alert people of a fire, church bells rang and the factory whistles sounded,"
had a couple of two wheeled hose carts with a hand pump and water storage tank. pump the water and hose a fire," Melton said. Hand pump wells were located at the Central Hotel and the Waugh Hotel. "Each company would race to the scene to see who could arrive first," Melton said. Hotel, Dr. D.W. Bolen's Boarding House, Mrs. J.W. Bolen's Millinery Shop and M.L. reservoir along the streets supplying homes and fire hydrants. Company burned to the ground. control. The factory was a total loss and was never rebuilt. In 1923, the fire department reorganized with Ralph Todd becoming the new chief. The firemen modified a Model T Ford to pull the hose cart. referred to today as "Granny" and still makes parade appearances. joined in the contest by Hillsville and Independence fire departments. Methodist Church until the school was rebuilt. efficient fire departments of any town its size in the state." candy, 3,000 oranges and 15 bushels of apples. took first aid classes and responded to drownings and wrecks, Melton said. One of the biggest disasters worked. by the fire department occurred on Jan.
Grayson County. Eighteen passengers were killed and one survived. was started. Mrs. Gussie Thomas was the first president. Firefighter's Relief fund to help firefighters that were hurt in the line of duty. 1960. Five women from Galax have served as officers for the State Auxiliary. department was notified for fire calls. out where the call was." In 1950, a dispatcher was hired to handle the calls and sound the alarm. ladies calling the men who lived too far away to hear the siren," Melton said. In 1951, Vaughan-Bassett Furniture burned and damages were more than $1 million. "This was one of the worst fires in Galax's history," Melton said. a ladder during a fire call. to this, using a 1940s Ford panel truck with a boat rack. 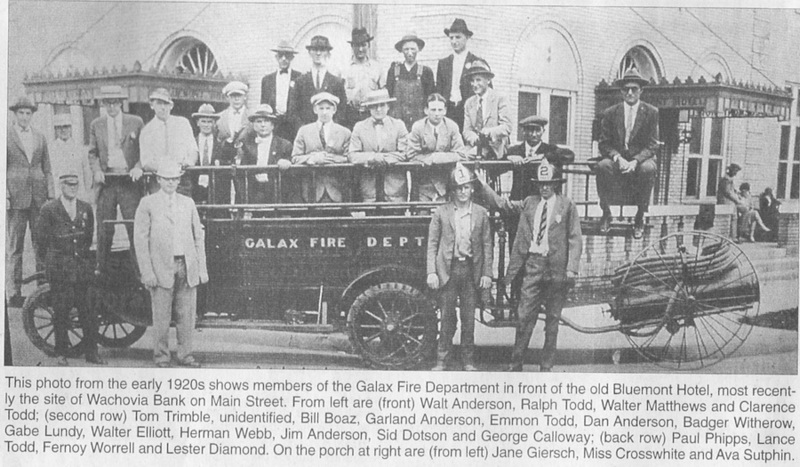 This photo from the early 1920s shows members of the Galax Fire Department in front of the old Bluemont Hotel, most recent­ly the site of Wachovia Bank on Main Street. From left are (front) Walt Anderson, Ralph Todd, Walter Matthews and Clarence Todd; (second row) Tom Trimble, unidentified, Bill Boaz, Garland Anderson, Emmon Todd, Dan Anderson, Badger Witherow, Gabe Lundy, Walter Elliott, Herman Webb, Jim Anderson, Sid Dotson and George Calloway; (back row) Paul Phipps, Lance Todd, Fernoy Worrell and Lester Diamond. On the porch at right are (from left) Jane Giersch, Miss Crosswhite and Ava Sutphin.